It's nice to have funny things to read on the way into work. 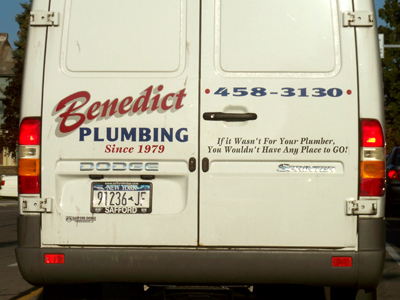 Who knew plumbers had such a sense of humor. I didn't realize so many sleeping children got left behind in school buses. 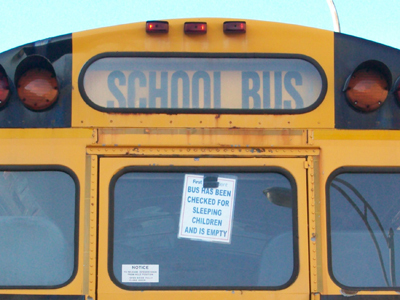 There has been an increase in sleeping children left on buses in the past few years. Can't recall if it's a local or a national problem, though. Years ago, when my friend was 5, she fell asleep on the school bus. she was in morning kindergarten and got out at noon, so no one noticed her until the older kids got on at 2:30. Scary? Yes. However it was 1980 and it didn't even make the news. it's easy for the kindergarteners to fall asleep on the ride home, especially when they have afternoon kindergarten. at that age, they're also so short that they aren't even really visible from the mirrors in the front of the bus. a friend of my son was so scared of the bus and getting off of it at the right place that he stayed in his seat during a bus fire drill and wasn't noticed until the bus reached the bus garage. it's better if the bus drivers are being extra cautious. I found out yesterday that my nephew was left behind on the bus and he wasn't even sleeping. The bus driver forgot about him and didn't realize it until she parked at the bus garage. Hahahaha I was so going to take a picture of that sign in a bus the other day!